In January 2007 I put my Airnimal in a suitcase and joined Edwin Jones, the secretary of West Sussex CTC, Martin and Peter on a trip to Australia. This is well documented on the blog Edwindownunder, but I took a slightly different route due to being a weak cyclist. 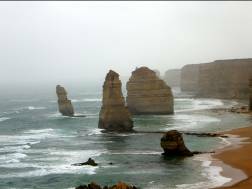 The trip was from Melbourne to Adelaide using the inland route and returning along the coast. We left England and went straight into cycling from Melbourne in 400C with a head wind and a mountain. I was really suffering with the heat and arranged to meet the others later. While I was resting by the roadside a “roadside assistance” van stopped and Phil assisted me to the motel in Ballarat. We passed Lake Wendouree where the hot weather and lack of rain caused it to be completely dry. Yachts and motor boats were resting on dry earth. When the others arrived they looked shattered after a couple more mountains and the headwind. All this happened on the first day cycling and there was another five weeks to go. After cycling through a flat area with trees and lots of kangaroos we stayed in Halls Gap, a mountainous area that had a forest fire the previous year. We passed burnt trees for about thirty miles but the vegetation was coming back and the light green leaves contrasted dramatically with the black tree trunks. When we arrived there were 168 forest fires in Australia. They were caused by thunder and lightening without rain. The average rainfall for February is 11 millimetres but while we were there we had 100 millimetres in one day, and this left just four forest fires. At Horsham I opted out of a trip across three deserts, against the wind and very high mileage and booked on a train to Adelaide. The first part of the trip was a straight run through hundreds of miles of sandy coloured countryside and I could not distinguish whether it was sand, dried grass or gathered wheat fields. This contrasted with the second part of the journey when we crossed from Victoria to South Australia and the scenery became green with trees. The track led to the River Murray and the Adelaide Hills. This part was very slow and tortuous on a single track through heavily wooded steep slopes. We arrived at Mount Lofty and suddenly there was a view of Adelaide below us as though we were in an aeroplane. I spent a week there exploring the cycle tracks leading to the yacht clubs, along the “linear parks” to the Adelaide hills and the Barossa valley vineyards. I also visited the city’s many gardens, open spaces and museums. When it rained I went to a jazz concert. I cycled to Wolf Blass for some wine tasting in the commercial town of Nuriootpa. It was an exceptionally well designed visitor centre, factory and interiors. 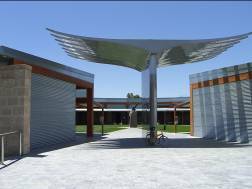 Modern design in Australia is a very high standard and very unique with its corrugated iron cladding and modern graphics. I felt my entry on a yellow Airnimal Chameleon was not the sort of customer they wanted. I mentioned I had never had a poor Australian red wine - this was corrected later - and mistakenly said I preferred French white wine. I was then subjected to a lesson straight out of her encyclopaedia of fairy tales on the difference between the Australian and French wines. 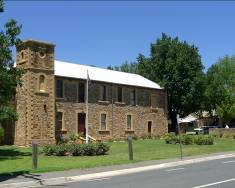 There was no more tasting here and I left to cycle through rolling hills with their regularly planted vines, small German town of Tanunda town and the other well known vineyards. On Australia day I returned from the coastal towns of Brighton and Glenelg, to Adelaide to hear numerous roars of the crowd at the cricket club. When I went to enter the hotel lift a man, dressed in a pink suit and pink top hat complete with corks on strings, was gloating at the thrashing they had given the English cricket team. I caught the next lift. Although our boys were not too good at bat and ball I wished the mad hatter had seen how on several occasions Martin cycled straight past the local racing cyclists as they slowly climbed the hills. His face would have been the same colour as his suit. In Adelaide Edwin decided to take a few hundred night-time photographs of the lights across the water. We crossed the lawns just as the sprinklers were starting and dodging them looked like a Monsieur Hulot film and continued when Edwin did not see the black swans that were next to him on the black lake as he took his photographs. The roads in Australia were very good but they were very narrow and the buses had to travel with their nearside wheel on the white line in order not to cross the centre line. It was the same white line that we followed! 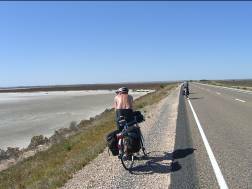 We had headwinds for two weeks and the roads were smooth, black, boring, bituminous and flat with an occasional bend, adjacent salt lakes and sometimes a roadside tree. We cycled from oasis to oasis. The road trains were fast and did not slow for anyone and so when they overtook us they forced oncoming traffic onto the gravel hard shoulder. On one occasion the other three cyclists were lost between two trucks as one overtook the road train on the inside! Fortunately at the rear of the trucks there was a cloud of dust and out popped the sprinters like rabbits out of a hat. On the way to Beachport I was tired, struggling against the wind and resting frequently. Although people in cars stopped to check that I had water they were not in cars suitable for a lift, not even for a folding bike. Previously we had cycled several miles on an unmade road and this led to a puncture, I found a hole in the tyre, it started raining and I became a little concerned as an eagle with a two metre wing span circled above. I finally arrived at the hotel after the restaurant had closed. The next day I caught the bus from this one-time whaling station to Mount Gambia. I was relieved to find it was not a mountain. It was a series of craters with lakes with connecting underground watercourses through the limestone strata that formed sink holes where the ground had collapsed. The limestone filtered the water and left the caves with streams and lakes of totally clear water that could not be seen and would take 500 years to reach the coast. I ordered some new tires from the Australian Airnimal agent, Ian at Flying Furniture, and they arrived two days later. The conversation with the man at the post office was a little like a conversation in ‘Allo ‘Allo. I simply could not understand what he was saying but I was grateful for his help and his colleague for translating that it was quicker for me to collect than have the parcel delivered to the motel! The incessant headwind that varied from 20 to 35 knots continued along the route and along the magnificent coast of the Ocean highway. We visited wild life parks, vineyards, rainforests, salt lakes and mountains. One day it was raining and I was wet and cold from the condensation in my water proof jacket, wearing rain soaked soggy gloves, knickers and socks, however, we then started to see the magnificent shapes and towering pillars that were formed by the raging surf eroding the huge ochre coloured limestone cliffs. It was the surf that led to 700 wrecks. The discomfort became an irritant. The next day the hot sun and the prevailing wind arrived and were with us as we cycled next to the sea with a cool breeze and the smell of seaweed and salt water. We spent hours finding and watching koalas, brightly coloured parrots and kookaburras. It became a holiday again rather than an experience. I felt very envious of the koalas being able to sleep nineteen hours a day. The evenings were the time to relax. The television programmes made ITV seem quite erudite. The news was mainly about cricket, drought and obesity with a useless rapidly presented weather forecast that Edwin then had to check on his computer. The bathroom showers were like standing under a water fall and the meals were large and so we understood the reasons for the news bulletins, but not why they were the same every day. We chatted over some very good meals and wines. As the wine went down Edwin and I were entertained by Martin and Peter reminiscing and acting as the cabaret. There were days when the trip was an “experience” but there were many others when it was a wonderful holiday. The language not only has an accent but also one can have a whole conversation without saying anything. “G’day, how are you, no worries, no problem, see you soon” If they do see us soon we would certainly have problems. There were two main reasons to go to Australia, to experience the scenery and to see and hear the wild animals. On the first day I was pleased to see a red kangaroo and I assumed there would be many more, but we were in a “gray” area and it was suggested I was hallucinating as I did not have a signed photograph! Generally wild animals were not to be seen where there were road signs warning us of their existence. We saw kangaroos, wombats, koalas, penguins, emus and many wild birds that we do not see in the UK. Once again I am grateful for Edwin and the sprinters allowing me to join them on their CTC holiday. Although it was a considerable challenge I certainly enjoyed it as much as the others, but in a very different way! The only problem I had with my folder was a puncture. 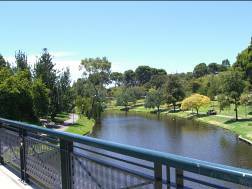 Left: Linear Park with a cycle track along the Torrens River to the Adelaide Hills. Right: Barossa Valley - Wolf Blass visitor reception, wine tasting and bike. Left: Hahndorf, a Bavarian town in the Adelaide Hills. Right: Smooth, black, boring, bituminous flat road adjacent to a salt lake. Left: North Port, Adelaide, a well presented tourist attraction. 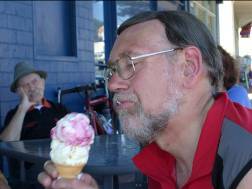 Right: Edwin having lunch in Brighton. Left: The Limestone Coast. Right: Wild life - but more sleepy than wild. 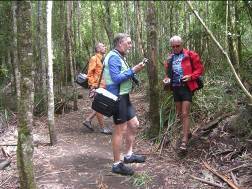 Left: Cyclists in a rainforest. 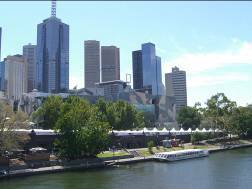 Right: Back in Melbourne.